The Vulcan Stove Fan quietly and efficiently circulates warm air from your wood or coal stove through your home or workshop, dramatically increasing the effectiveness of your heating appliance and improving your comfort level. No longer will you have to stoke your stove to blazing hot temperatures only to end up with a VERY hot area in the direct proximity of your stove and mildly warm air across the room. The Vulcan Stove Fan will help uniformly circulate the air, leaving you a cozy, comfortable atmosphere to enjoy while reducing the amount of fuel your appliance consumes. In addition, the Vulcan Stove Fan costs you absolutely nothing to operate! How can it cost nothing to operate? Doesn't it need batteries or have to be plugged in? No! In fact it does not use any electricity. 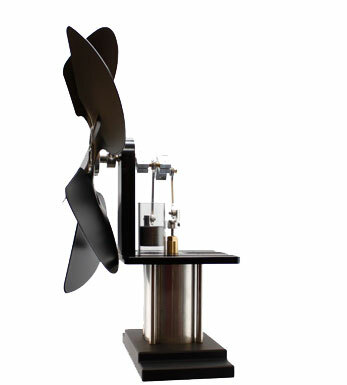 The Vulcan Stove Fan's power comes from a small Stirling-Engine cycle powerplant that uses only the heat from your appliance as fuel.